This timely reference guide reflects the significant issues and the current state of American religious history. 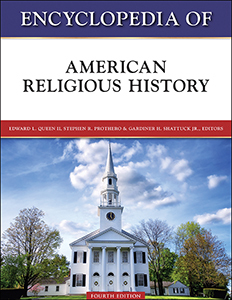 In hundreds of thoughtful, informative entries, Encyclopedia of American Religious History, Fourth Edition outlines the numerous philosophers, personalities, social issues, and cultural histories of religious practices throughout American history. Special emphasis is placed on recent developments in religious life in this country and the historical contributions of people long neglected by mainstream religious historians, including African Americans, Native Americans, and women. Edward L. Queen II holds a Ph.D. from the divinity school of the University of Chicago. He is director of the Center for Ethics at Emory University. Stephen R. Prothero holds a Ph.D. in religion from Harvard University and is currently an assistant professor in the religion department at Boston University. His area of specialty is Asian religion in America. Gardiner H. Shattuck Jr. is an Episcopal minister with a master's degree from the General Theological Seminary in New York City. He holds a Ph.D. in religion from Harvard University.